It’s that time of the year again in the NBA when legends are born and dynasties are built. That’s right folks, the smell of the NBA Finals is in the air. This year’s spectacular matchup features two NBA powerhouses: the star-studded Miami Heat against the old-school San Antonio Spurs, in what promises to be an intriguing battle for bragging rights to be called the best in the basketball world. 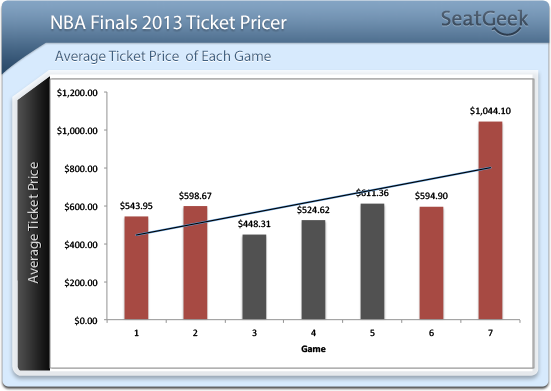 Here at SeatGeek, ticketing data is our crown jewel and so, we thought we would share some interesting insights into one of the least-talked about aspects of the Finals: the ticket prices for each game. We are firm believers that trends in these prices can actually reflect consumer sentiment and demand towards the finals and based of their movement, we can make estimates as to what fans predict the outcome of the next game will be. A closer look, and detailed breakdown, of the data, reveal some additional interesting insights on ticketing prices. 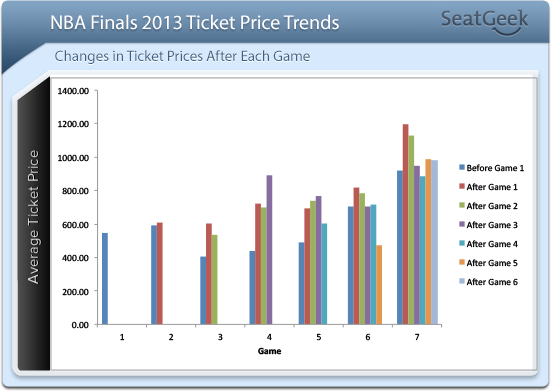 On average, ticket prices for the 2013 NBA Finals have been trailing those in 2012 across the board. 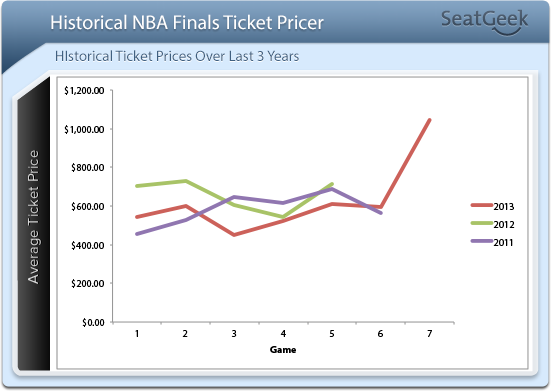 Compared to the 2011 Finals, prices have been higher over Games 1 & 2 but dipped below for Games 3 to 5 Game 5 before leveling off a in Game 6. Nevertheless, ticket prices to Game 7 in this year’s finals are off the charts, easily blowing past historic prices over the past 2 years – looks like the world is in for an intense final showdown in Miami. Lastly, given the concurrent excitement about the Stanley Cup over on the ice, we thought it would be intriguing to contrast ticket prices for the finale of these two major sports. 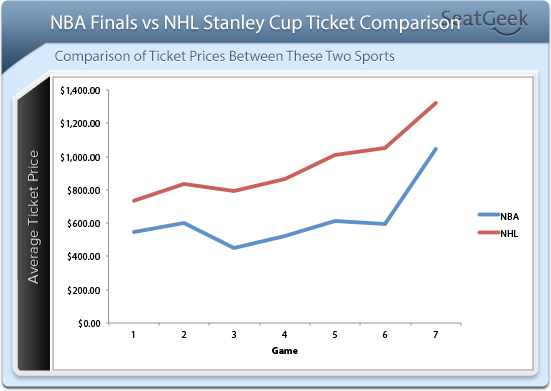 No argument there: on average, the value of tickets to an NHL Stanley Cup game are substantially higher than those to an NBA Finals game. Who knows, perhaps NHL fans are indeed more passionate about their team than their NBA counterparts. Fans, what do you think about these findings? We’d love to hear your opinions and sentiment on these trends and the NBA finals overall.